Jasmin (right in the picture) grew up near Frankfurt and is living in Munich since 2013. She has a degree in business administration and worked in an industrial group for 9 years. In 2015 she co-founded the “Über den Tellerrand München e.V. association”. 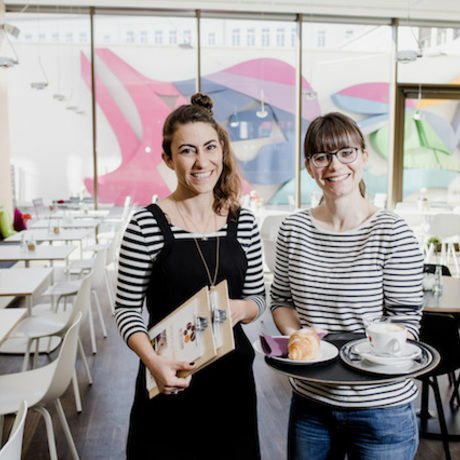 Since 2018 she has been managing director and founder of the café “Über dem Tellerrand”. Born in Freiburg Julia (left in the picture) is living in Munich since 2013. After her studies she worked as a TV and video editor for 5 years before starting her own business in this field 2 years ago. Since 2015 she has been involved in the association “Über dem Tellerrand kochen München” on a voluntary basis. In 2018 she founded “Über den Tellerrand” Café. Refugees work at this cozy cafeteria where you get delicious food. We serve coffee & muesli. If you would like to try “their” specialities, please bring some money. It is non profit, so you are doing good!